This entry was posted in Fashion, PersonalStyle and tagged closets, fashion, organization, personal style, Project Runway, storage. Bookmark the permalink. Oh sigh – I am so nosy about other people’s closets, I read this post twice, and studied your photos for more clues. I know I am a mental health professional, but I have to ask — is that crazy?? Of course I long for the closet you describe in your first paragraph. Since I don’t have it yet, at age 56, I don’t think it’s in the cards. 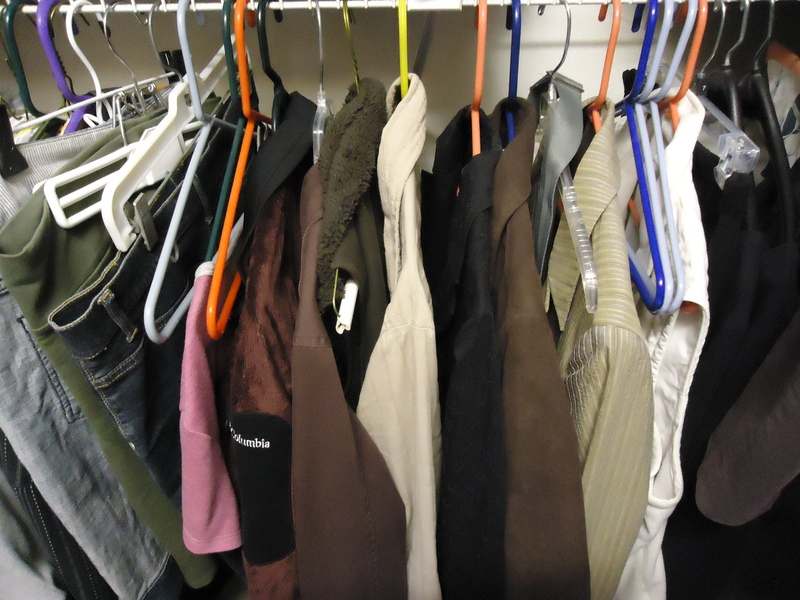 I do color-coordinate, and keep long away from short, and try to have a little space between hangers. I think you’ve done a good job along these same lines, and your jewelry is *much* neater! 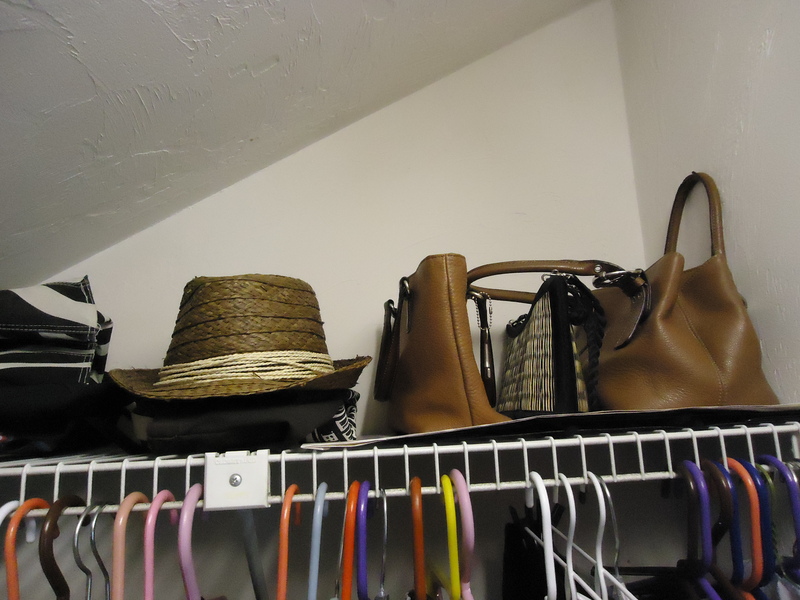 You’ve kinda inspired me to share our closet….maybe….if I clean it first…. I also long for a closet which is like a little room…all decorated…with a rug and a chandelier! I only see it happening in my dreams. But you do have me curious about other closets…why are we that way!! Color coordination also gives me the allusion of organization…I am scheduled to clean out the closet over spring break…good thing about teaching…we get a spring break!! The best thing you can do for any closet is to get those new style flocked hangars (Huggable?) from HSN or Target. They save you time, dry cleaning money, and your clothes. I hang wet cashmere sweaters on them. I hang up all my t-shirts so I can see them at a glance and they don’t have all those folding creases on them. oooh, nice! 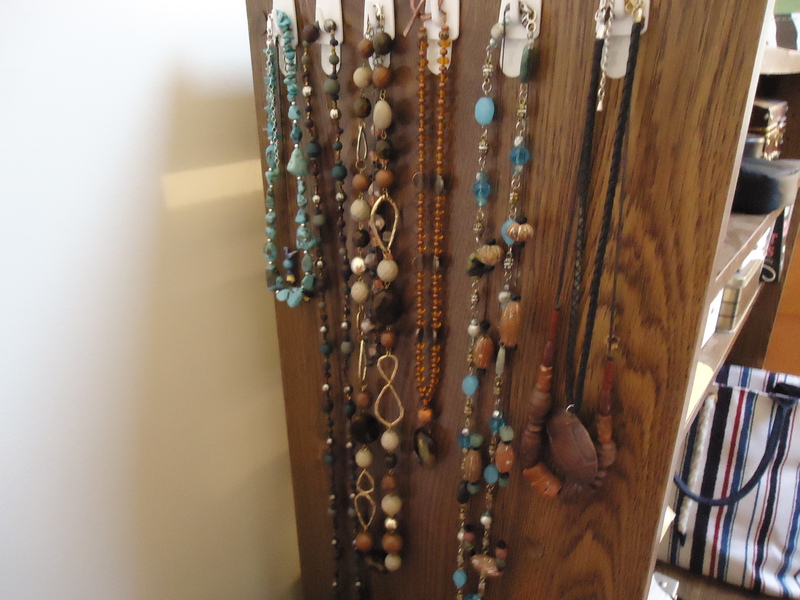 They are somewhat similar, but I am VERY envious of the hanging hooks that you have for necklaces. Thanks for sharing! 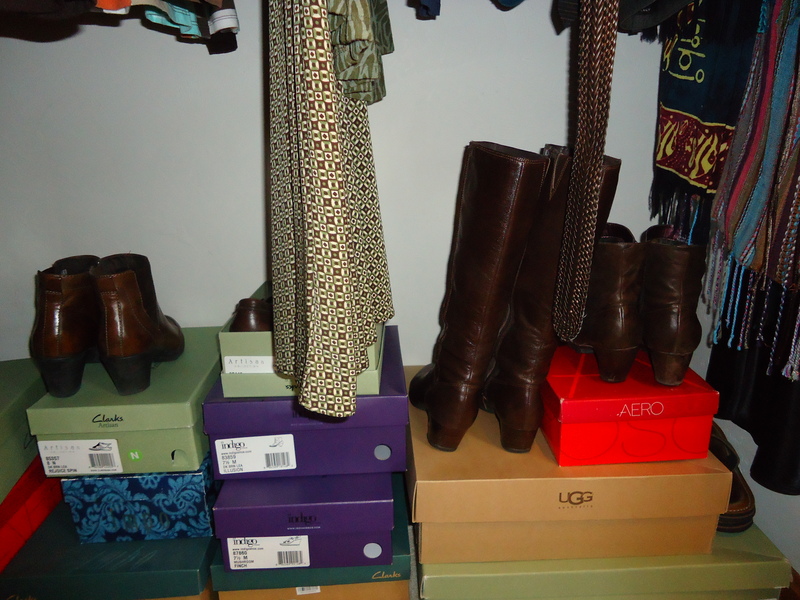 I have a structurally beautiful closet, but it gets a little messy…. Love the reference to Shelley Hack in the old Charlie commercials….they were so uplifting! I am very fortunate to have an extra room in our home to use as a closet. It is such a luxury to me because I love to be organized and this helps me to have most everything in one place. We did not do the professional install…. ($$$$$), but bought the white racks and shelving similar to your closet. (which by the way, is very tidy!) I had a couple mirrored wardrobes from my condo and they help to balance out the room. I did notice in your closet that you are limited in hanging spce because of the type of shelving installed. The bar that you hang your pants, blouses, etc. has small squares or gridwork and you cannot just “smooosh” in all of your hangers. I think that type of shelving is designed for sweaters, etc., and there is another style without the small squares. Does this make sense or am I just “knit-picking” ? I don’t mean for you to re-do your closet, but if you decide to add more shelving, it may be helpful. Beryl is right; the “huggable’ hangers are quite good. Your garments will not slide off of them. Thank you for sharing your closet space. 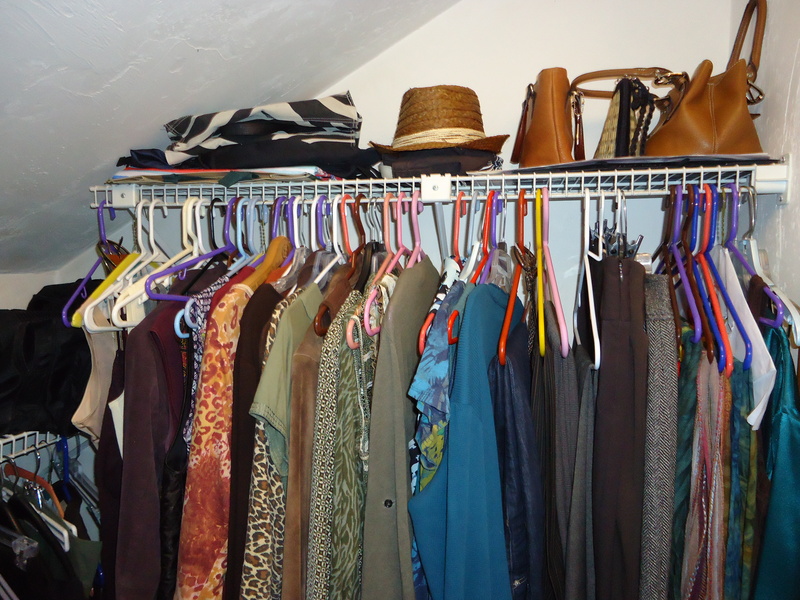 When I listed my condo with a realtor, the one thing that freaked me out was having to post photos of my closet…..I don’t know why I am so private about some things. Thanks for the comment! Yes, I know exactly what you mean about the shelving. It’s annoying, actually, because I can’t slide hangers back and forth. I’ve always figured this could be changed — or that I could somehow hang a bar from the existing shelving, to hang below — but like everybody, I’m SO reluctant to spend limited funds. Maybe some day. Your setup sounds great! 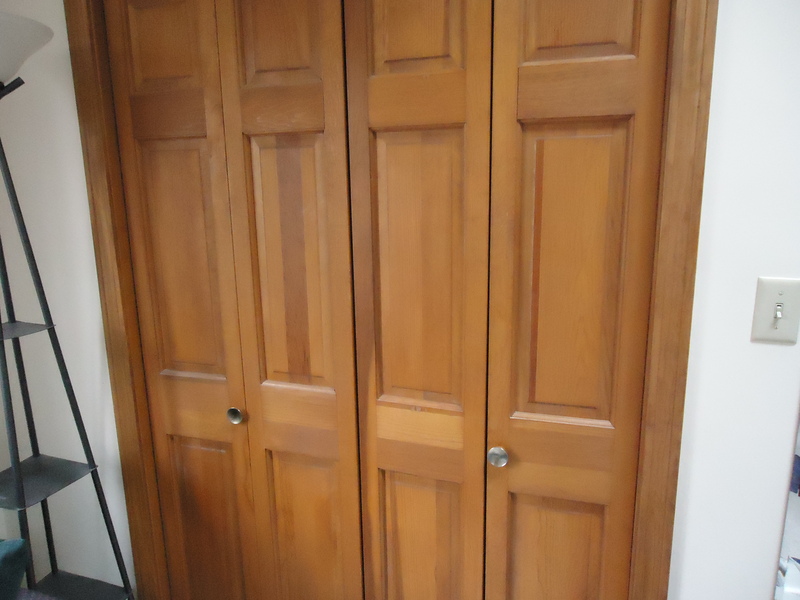 I’m afraid that the few closets that were in my 1910 home were ripped out to fit in a half-bath. My entire wardrobe fits in an IKEA wardrobe. (When our house was reappraised a few years back, the guy said you couldn’t call a room a bedroom unless it had a closet – in that case we have three unidentified rooms!) 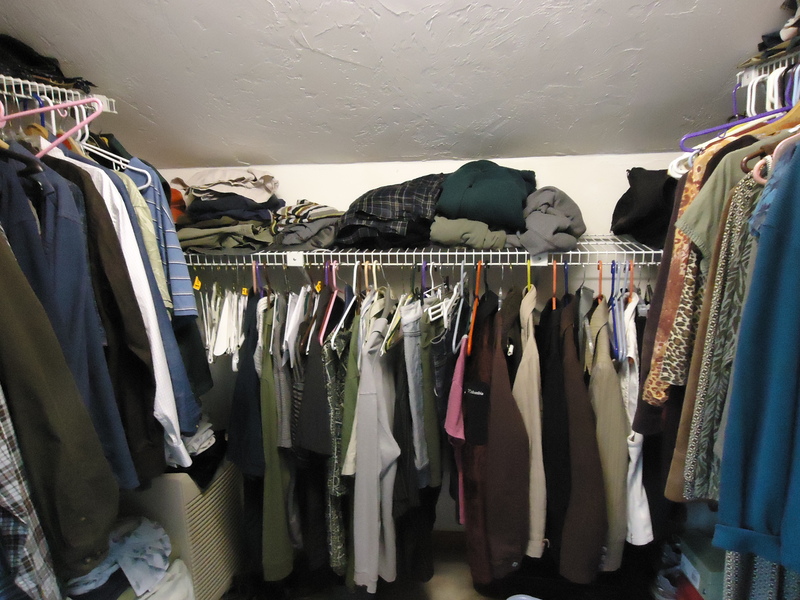 We do have one lone closet upstairs where I rotate clothes for the seasons. So though I’m in California, I have no California closet (and only two seasons). 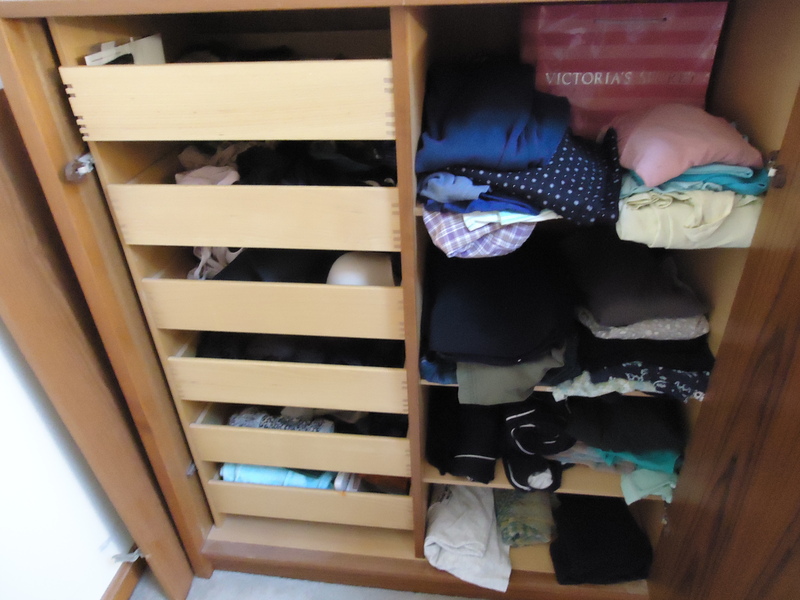 I organize my clothes based on sleeveless, short sleeves and long sleeves. I have all of my necklaces hung on a bulletin board that’s covered with wild paper. It’s sort of an art piece in our bedroom. The size of my IKEA wardrobe forces me to take what I don’t wear to the local Out of the Closet. I have a easy closet system. I actually designed it myself on their website and hubby installed it for me. It’s not one of those huge dream closet with a chandelier, but I’m pretty happy with it. It’s a pleasure now to walk into my closet! I’d love to have a room dedicated as a closet. 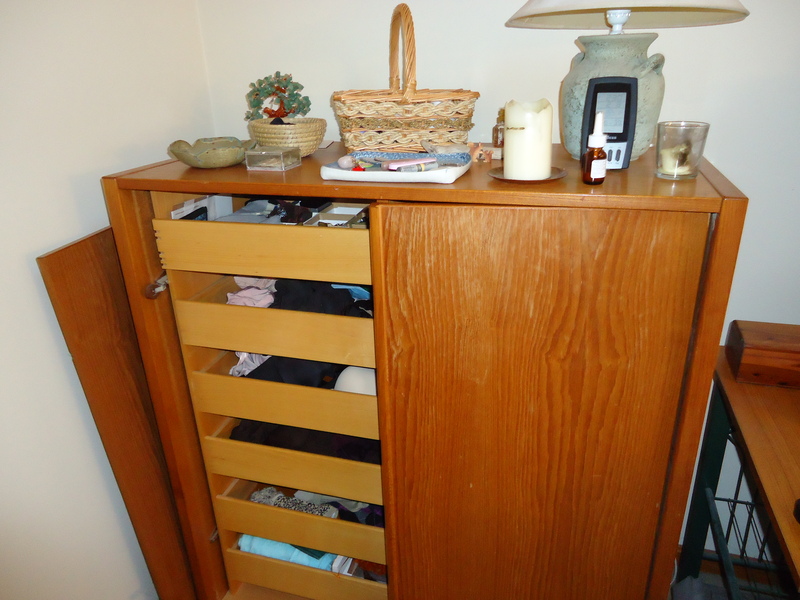 I do have clothes in a couple of closets, but in a 1960’s home, they did not build closets like they do today. I have stuff everywhere. I really do need to organize. I have good intentions, but just don’t seem to get it done. Your closet looks so organized. Maybe someday I will get organized. I liked this tour of your closet. Perhaps I should be ashamed to admit that in the past year, I took over ALL of our shared closet and half of the guest room closet. Perhaps I’ll do a tour of my dresser though it is in a very dark spot and photos may be a problem (and I’ll have to tidy it up first). I must say though that your jewelry is the most organized I’ve ever seen. I don’t think you should be ashamed at all. With your revolving collection of mostly thrifted items, you have about the most creative and least wasteful wardrobe I’ve seen! But you definitely need space to store it. 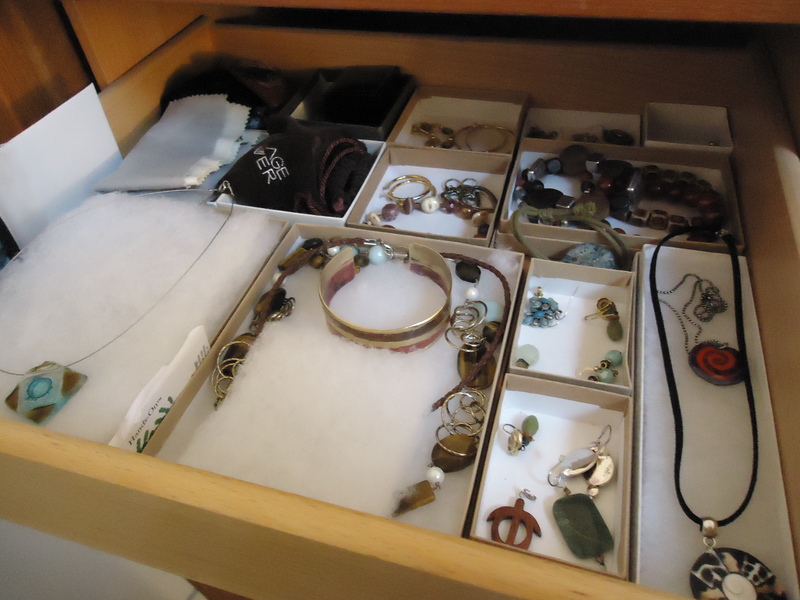 (And yes, I love having the jewelry organized. It makes it pretty to look at! Though part of me would love to have everything draped from statues or mannequins, as I’ve seen some people do). Gail I just watched that movie – again. It’s a dream closet for sure!! Wow, your closet is very orderly. Mine is small and cluttered. I have been trying to rationalize things – and I did take some photos for a blog post not so long ago, but I think more work is needed before I show the world. Well, I think cluttered closets have their beauty, too. It always seems like many creative possibilities are lurking within them. I’m a bit upset to notice, for the first time, that I spelled minimalism wrong in the title of that post. Would it kill blogger to enable spell check for the titles? Ah, the essential closet conflicts- more/less, better/budget, edit/stockpile. Thanks for your compliments. I am pretty proud of that closet now, and happy to say that it has stayed quite clean since the photos were taken, which is not typical of me at all. Having done it myself I’d encourage anyone to take even small steps towards creating their dream closet- it does make you appreciate what you have more when it is invitingly displayed. To get me closer to my dream I’d like to replace the utilitarian plastic drawers in my closet with a snazzy vintage dresser, put up a couple of fancy coat hooks, and upgrade the shelving. OMG, that is just amazing. I LOVE what you did there. So innovative! Take that, insufficient closet space. That’s a nice looking closet. I try to keep with nice hangers like those but the wire ones from the dry cleaner have a way of slipping into the mix. I’m always suspicious of closet “systems” that involve buying special things. I feel like “found” storage works about as well, even if it doesn’t look like a magazine. I think you’ve done a good job of working with what you’ve got. I enjoyed your post about real life closets very much. I think your collection of stuff is growing and you will need more space soon. I also keep my bags and shoes and jewelery seperately. Oh, Anne, I don’t think I could face the shame of letting someone see my closet with the door open. My closet just doesn’t support my image as low-maintenance woman. Oh dear, I hope I haven’t given birth to a new phenomenon: Closet Shame! 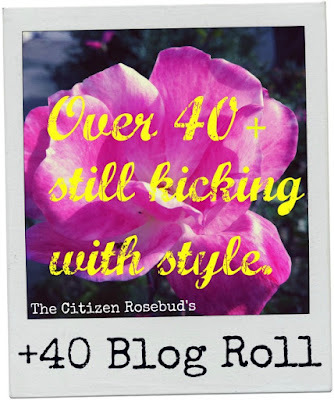 I think you should just revel in the creativity of your closet! Getting dressed can be like a treasure hunt. Love your posts as always. I feel like I could stumble into your house and feel like I was home. I finally broke down and bought the slim hangers (I was getting the expensive ones at I forget what the name of the store is — one of the bath stores — begging all my friends to sign up for their mailing list so I could get the $5 coupon for them), and then found the hangers at CostCo. love that store. And they do give you more room, which my excessive and obsessive thrift-store shopping needed these days.